EMI Pro Response EMT Gear Bag Complete with EMS Equipment FREE SHIPPING! Black color bag does NOT contain the Star of Life Reflective Emblem. 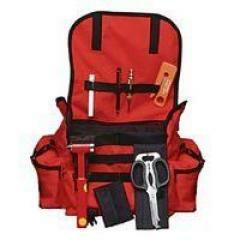 The Pro Response EMT supply Bag features easy access, durability and storage. Flap top with Delrin buckles allows for quick access. It has a padded 3 section main compartment, two wing pouches and dual front pockets with hook and loop closures. Comes complete with rifle sling style strap with reinforced steel rings and hooks. The Pro Response Plus supply bag is a combination of the Pro Response Bag and basic first-on-the-scene equipment; Pro Response Plus supplies includes: Pro Response Orange or Navy Bag, Nitewriter Pen, Deluxe Lifesaver Hammer, Window Punch with clip, Multipurpose Rescue Shears Set, Seat Belt Cutter, Standard Glove Case, Finger Ring Cutter and Disposable Penlight. ©2002-2019 CopsPlus.com: EMI Pro Response EMT Gear Bag Complete with EMS Equipment FREE SHIPPING!